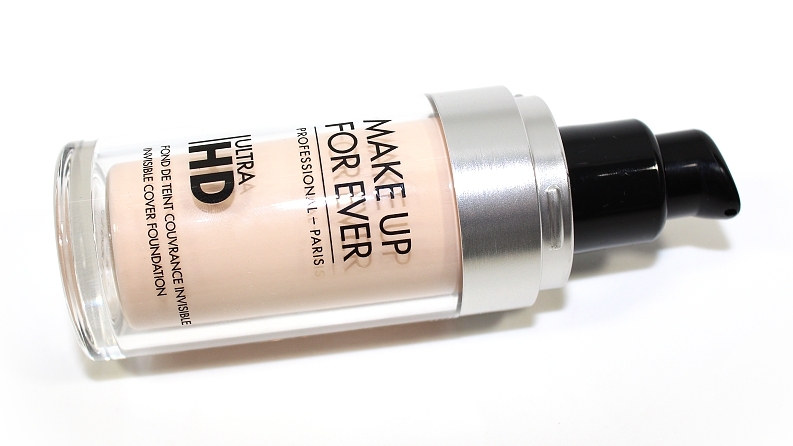 Make Up For Ever Ultra HD Invisible Cover Foundation (1.01 oz.) retails for $43 USD ($50 CAD) and is available in 40 shades. 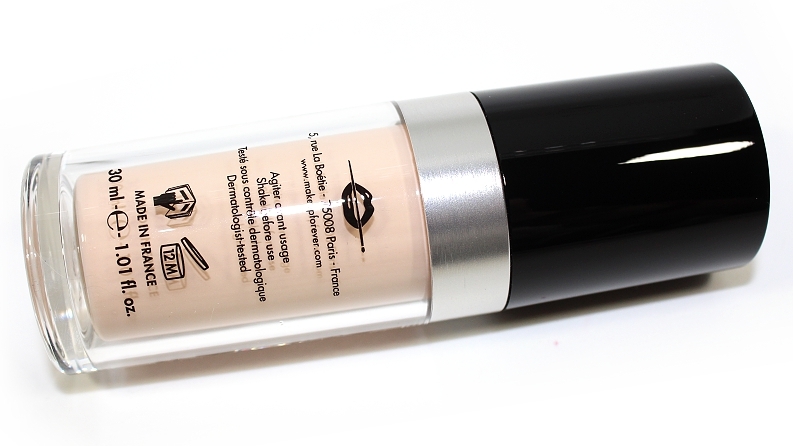 It is said to be "a bestselling HD foundation that appears more invisible, comfortable, and natural-looking than ever before." * My Shade: Y205 is described as alabaster. 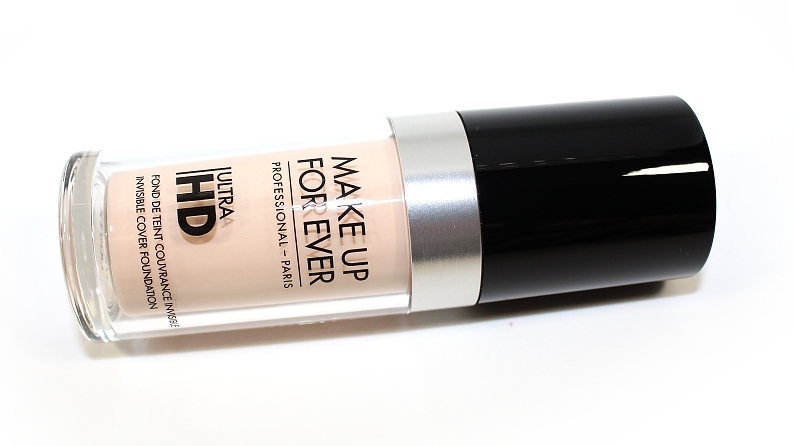 "Developed specifically for the film and TV industry's most advanced technology, Ultra HD Liquid Foundation creates a naturally flawless complexion—on and off camera. Completely invisible under the latest, super-focused 4k lens, this revolutionary foundation features uniquely-coated pigments that provide medium-to-buildable coverage with an even lighter weight, second-skin texture that looks just like skin. This lighter weight formula delivers the very same flawless results as before when applied with a flat foundation brush in a tap and stretch motion." The packaging is a clear, plastic bottle and features a pump that disperses a generous amount of product. While this foundation isn't fragrance-free, no scent can really be detected. The formula is a fluid, liquid consistency—not too thin where it becomes runny, but also not too thick where it becomes difficult to blend. 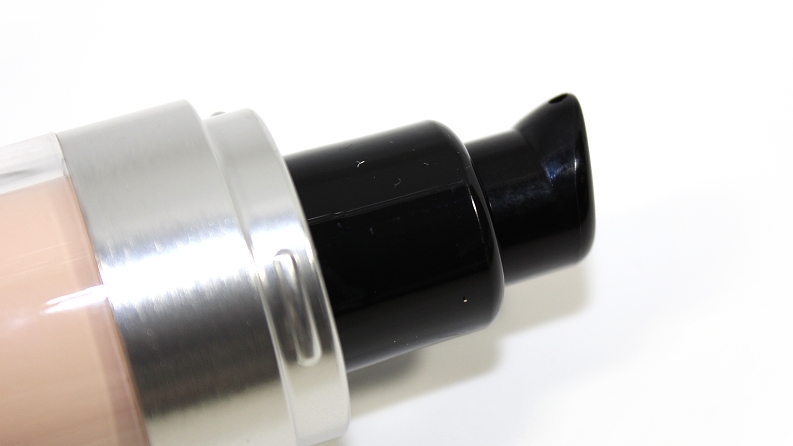 The finish is incredibly natural and depending on how much product is applied, it can lean towards a satin finish. Despite the "great for all skin types" claim, this foundation will be ideal to those with lightly dry, normal and combination skin types. While the natural/satin finish is ideal for those with very dry or problematic skin/acne, I found the foundation didn't sit very well and left those areas looking accentuated and scale-like. Of course, exfoliating your skin and applying a generous amount of moisturizer prior to application can help. For those with oily to very oily skin, you will definitely want to set this foundation with powder and will likely find yourself blotting away excess oil throughout the day. On the topic of oil, I should also mention that even though my skin is excessively dry, I found my t-zone to be oily—to the point of the foundation separating on the tip of my nose—by the end of the day. The coverage of this foundation was medium and could be built to a degree. One to two pumps does an excellent job of covering the entire face while correcting any redness, discoloration, imperfections and improving the overall "healthy" appearance of skin. I found layering too much product, especially in terms of spot correcting any areas that needed a little extra coverage, can make the foundation much more visible on the skin and settle in to expression lines easier. In terms of application, I personally prefer applying the foundation directly to my face using my fingers, as it provides the most coverage. I found brushes (ie. foundation, stippling, buffing) gave off a medium coverage at most and sponges, like the BeautyBlender, provided a lighter, sheer coverage. With either method, the liquid consistency blended out incredibly easily on my skin and my freckles were still visible, but any redness I had prior became unapparent. During wear, the foundation was comfortable, felt weightless and was never tacky before setting with a powder. Powders and concealers also layer well without moving or disturbing the product. I felt this foundation never fully set on its own, so you will want to pair it with a setting powder or powder foundation, just to help prevent the foundation from transferring or fading easily throughout the day. When I tested this product both with and without a primer or base, the wear time and overall look of the foundation performed much nicer when paired with a mattifying primer—any fading or settling that typically happens with my skin, was less visible. After an entire day, the foundation wore quite well—it was around the +7.5 hour mark that I really noticed the product start to break down and show signs of wear around my nose and expression lines—which happens with any and every product I put in those areas, it's just how my skin works. In comparison to the original HD Invisible Cover Foundation, I found the new formulation to be lighter and provide less coverage. With the new Ultra HD formula, they have also updated and expanded their shade range from the previous 26 to an outstanding 40—covering more fair to deep skin tones. The undertones are also much easier to detect (ie. "Y" for yellow/warm and "R" for red/cool) and while the number system has also changed, the brand has listed both the old and new equivalent numbers on the label. However, keep in mind since the finish, texture and coverage isn't the same as before, what used to be your "perfect match" may not be now. Overall, this is an extremely natural, skin perfecting foundation. While it may not be the most long-lasting formula, the brand technically never claims for it to be—after all, it was designed for use in the film and camera industry to look the least apparent, nearly invisible for HD and 4K technology. To sum it up, the formula is comfortable, weightless and the shade selection is phenomenal; Make Up For Ever made it very easy to find the perfect match for your skin tone. So whether you're in the market for a new foundation or the original HD Invisible Cover Foundation was your go-to, the new formulation is definitely worth checking out!